Click here to view our music license terms. 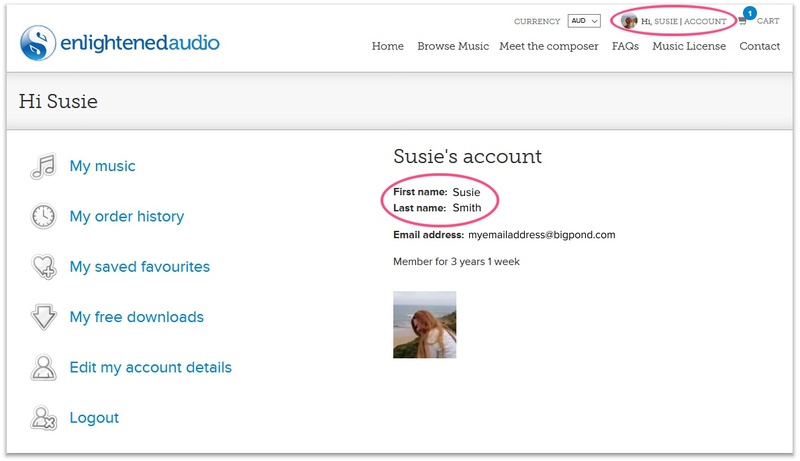 To purchase music for a client, simply log out and create a new account that is registered under your client’s name. Any music purchased using this account will automatically be licensed to that client. You can create separate accounts for as many clients as you need to. We recommend that you provide each of your clients with their account login information and a copy of the license terms. Handy tip: If you have already created an account and wish to change your account details, you can do so by clicking on “Edit my account details” as shown in the example above. Why can’t I purchase music for multiple clients within one user account? At Enlightened Audio we provide extremely generous discounts of up to 60% in the form of store credit discount packs. The purpose of these discounts is to reward loyal customers who purchase large quantities of music from us. We can’t allow people to stockpile store credit in one account and then use it to buy discounted music for multiple clients, each of whom may only want one single track. It’s all about fairness.